Review: The Rage to Live: The International D.P. Children’s Center Kloster Indersdorf 1945-46. By Anna Andlauer, transl. and revised by Tobe Levin. (E-book, 2012, ISBM 978-1479322893) (Originally publ. in German as Zurück inse Leben. Das international Kinderzentrum Kloster Indersdorf 1945-46, Antogo Verlag, Nuremberg, 2011. Since this harrowing and yet optimistic book is a tribute to the unsung heroic social worker Greta Fischer, primarily for her work in Germany on behalf of UNRRA (see http://en.wikipedia.org/wiki/UNRRA) , I begin this short review with an overall look at progressive/postmodern views of the human psyche and social organization. We shall see that though the author nods to Anna Freud as major proponent of the lifelong benefits of a tight mother-infant bond (p.173), the general approach of the Kloster Indersdorf D.P. Children’s Center was “behavior modification” toward the goal of “physical health and the beginning of a moral and spiritual rehabilitation” (p.160, quoting Greta Fischer, p.161). The notion that Anna Freud would have approved of the appropriations of her work for the encouragement of either ego psychology or behavior modification is misguided. See http://en.wikipedia.org/wiki/Anna_Freud. 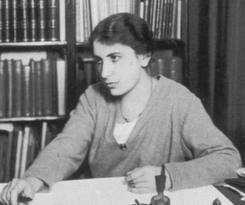 Did Anna Freud ever recover from her depression and/or her inner conflicts? 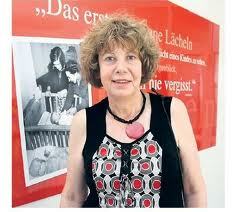 Which raises crucial questions about the overall ideology guiding the immense field of “social work,” especially given the triumphalist tone of Anna Andlauer’s book, which tells the stories of hundreds of severely traumatized displaced children, uprooted during World War 2 (many of them Holocaust survivors), but identity politics inform Andlauer’s view of recovery, and she uses the code words we associate with that ideology: a healthy “identity” is understood as “rootedness,” hence a reconstituted self is maintained through renewed contact with native language and local cultures. Indeed, Andlauer provides numerous photos of individual survivors of varied nationalities, smiling broadly and showing their names in placards covering their presumably healed hearts, but she is less enthused about the value of “assimilation”, for the youngsters who made it to Palestine/Israel and various kibbutzim are mildly criticized for accommodation to a “sabres”[sic] identity (p.167). Especially troubling to this reviewer is the notion of “resilience” as applied to these survivors, given to the “rage to live,” notwithstanding watching or learning about the destruction of their entire families, then the deplorable waiting for the Western Democracies to either allow them into their countries or to go to the newly constituted Jewish State. With respect to “behavior modification,” although that term is not used until the last pages of the book, we understand that cleanliness, medical treatment for scabies, lice, and infectious diseases, family-style meals, plentiful food, different china for different courses, vocational training for farming and other “trades,” behavioral boundaries intended to return the often aggressive youngsters to traditional notions of order, plus contact with kindly but firm and trustworthy mentors listening to the children’s stories (over and over), presumably prepared the deeply traumatized children for a healthy adjustment to life in either their countries of origin or in the few societies that allowed them entrance (for the Jews, Palestine/Israel, or the U.K., Canada, Australia, and the U.S.). To complete this compressed survey of Anna Andlauer’s book, I remind the reader of Herman Melville’s bitter chapter on the interactions between the Invalid Titan and the “herb-doctor” in The Confidence-Man (1857). Melville’s relatives were impatient with his own brooding and prolonged suffering, probably adding to his malaise. It is ever so much more comforting to believe that all psychic wounds, no matter how profound, can be healed and managed with positive thinking and other progressive nostrums. One of the more entertaining ones is appended below. It can be predicted that we will find the German people profoundly humiliated, resentful, disenchanted, dejected, morose, despairing of the future. Accustomed to obeying an arbitrary external authority, they will have no dependable inner guides to control behavior. There will be a wave of crime and suicide. Apathy will be wide-spread. Having passed through a period of intense unanimity and cooperation, Germany as a social system will fall apart, each man to suffer pain and mortification in private. Disorganization and confusion will be general, creating a breeding ground for cults of extreme individualism. A considerable part of the population will be weighted down by a heavy sense of guilt, which should lead to a revival of religion. The soil will be laid [sic] for a spiritual regeneration; and perhaps the Germans, not we, will inherit the future. It is assumed that the Allies will demilitarize Germany, will insist on efficient guarantees against future conspiracies, will take steps to liquidate the Junker Class, will prevent rearmament and the misuse of raw materials. As Dr. Foerster has said: a soft peace for Germany will be a very hard peace for the German people, delivering them to the Prussian caste who led them astray. Nothing permanent, however, can be achieved by such measures alone. What is required is a profound conversion of Germany’s attitude: abandonment of the idea (1) that they are innately superior; (2) that they are destined to govern the earth; (3) that there is no human law or authority higher than the good of the German State; (4) that power is to be admired above everything; and (5) that Might makes Right. In treating the Germans psychologically we must realize that we are dealing with a nation suffering from paranoid trends: delusions of grandeur; delusions of persecution; profound hatred of strong opponents and contempt of weak opponents; arrogance, suspiciousness and envy–all of which has been built up as a reaction to an age-old inferiority complex and a desire to be appreciated. Possibly the first four steps in the treatment of a single paranoid personality can be adapted to the conversion of Germany. In attempting this we must not forget that the source of their psychic sickness is wounded pride. 3. (a) First Step.-The physician must gain the respect of the patient. (i) Individual paranoid.– Paranoids cannot be treated successfully if they are not impressed (consciously or unconsciously) by the ability, knowledge, wisdom, or perhaps mere magnetic force, of the physician. Special efforts must sometimes be made to achieve this end, since paranoids, being full of scorn, are not easy to impress. (ii) Germany. The regiments that occupy Germany should be the finest that the United Nations can assemble – regiments with a history of victories, composed of tall well-disciplined soldiers commanded by the best generals. Rowdiness and drunkenness should not be permitted. The Germans should be compelled to admit: “These are splendid men; not the weak degenerates (democratic soldiers) or barbarians (Russian soldiers) we were led to expect.” The Germans admire orderliness, precision, efficiency. (ii) Germany.– Germany’s countryside, its music, historic culture, and monuments of beauty should be appreciated and praised. The army of occupation should manifest intense interest in the culture of Old Germany and complete indifference to all recent developments. The troops should be instructed and coached by lectures and guide-books covering the district they will occupy. They should be told that the war is not won until the heart of the German people has been won. Germans of the old school should be hired to teach the German language, to guide the soldiers on tours of the country and of museums, to teach native arts and skills. Concerts should be arranged, omitting pieces that have been specially favored by the Nazis. Editions of books burned by the Nazis should be published and put on sale immediately. All this will serve a double purpose. It will provide education for our troops and occupy their time; thus helping to maintain morale. Also the submerged inferiority feelings and resentments of the Germans will be alleviated. 3 (c) Third Step. – Insight should be tactfully provided, a little at a time. (i) Individual paranoid.– Very gradually, step by step, the patient is enlightened as to his own paranoid mechanisms. Pride in being uncriticizable and always in the right must be gradually replaced by pride in being able to rise above his own mechanisms and criticize himself, pride in being strong enough to admit some weaknesses and erros [sic]. He should be made to understand that he has been victimized by unconscious forces which gained control over his proper self. During the course of these talks the physician should freely confess his own weaknesses and errors, the patient being treated as an equal. (ii) Germany. The last ten years of German history should be interpreted as a violent infectious fever, a possession of the spirit, which took hold of the people as soon as they gave ear to the false prophets of Fascism. A series of articles, editorials, essays and short books should be written now by Germans in this country (Thomas Mann, Reinhold Niebuhr, Foerster, and others), aided possibly by suggestions from psychiatrists, to be published in German newspapers and distributed soon after the occupation. They should be therapeutic essays essentially- perhaps signed by a nom de plume as if written by a minister, physician, or writer in Germany. Not too much should be said in any one paper; but, in time, the lies, delusions, treacheries and crimes of the Nazis should be reviewed objectively and in historical sequence. The German people should be made to understand that the world regards them as unwitting and unhappy victims of instinctual forces. The Allies should be magnanimous enough to admit their own errors and misdeeds. 3. (d) Fourth Step. The patient should be insociated in a group. (1) Individual paranoid. Having attained a measure of satisfaction by winning the respect and friendship of his physician and then having gained some insight and control, the patient is ready for group therapy. Later, he can be persuaded to join outside groups. Gradually he must learn to take his place and cooperate on an equal basis with others. The group he joins should have a goal. (ii) Germany. If Germany is to be converted, it is of the utmost importance that some strong and efficient super-government be established as soon as possible, providing a new world conscience, that her people can respect. As said above, Germans must have something to look up to – a God, a Fuehrer, an Absolute, a national ideal. It can not be a rival nation, or a temporary alliance of nations. It must be a body – a strong body with a police force–which stands above any single state. A supranational symbol would eventually attract the deference that is now focussed upon Hitler. Lacking such a symbol, many Germans will certainly fall into a state of profound disillusionment and despair. At the proper time Germany should be insociated as an equal in whatever league or federation of nations has been established. From here on the therapy of a single paranoid personality fails as an analogy, principally because the German people will not be in the position of a patient who comes willingly to the physician’s office. The Nazis will be in no mood to be educated by their enemies. Furthermore it would be very presumptuous of us to try it. The most that the Allies could do would be to close all schools and universities until new anti-fascist teachers and faculties had been recruited. The greatest problem will be in dealing with a whole generation of brutalized and hardened young Nazis. (Perhaps exhibition games of soccer, football, lacrosse and baseball between American and English regiments would serve to introduce ideas of fair play and sportsmanship; but much else must be done – by German educators). For the conversion of Germany the most effective agency will be some form of world federation. Without this the Allied victory will have no permanently important consequences.